TigerMan graduated tonight. 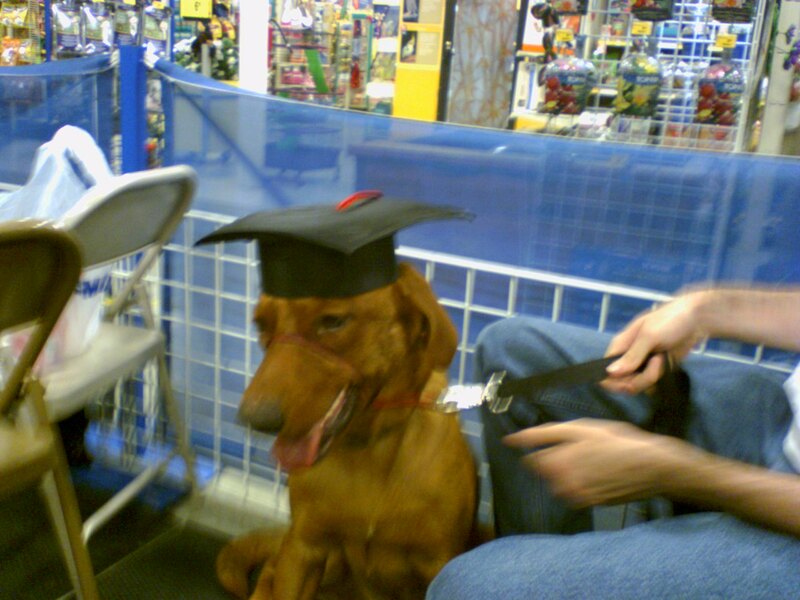 He was on his best behavior during the evening’s ceremony, so needless to say we were pretty sure he wasn’t going to graduate. The exam was a tough one. He had to: sit, stay, lay down, “watch me”, come and walk nicely on his leash. The last one was the toughest for him but he mustered just enough will power to do it. So no obedience school drop-outs here. He got his diploma. He was so proud in fact, that he didn’t fuss, too much, about having a graduation cap placed on his head for us to take pictures. We were so proud. So here’s to higher education and it’s latest graduate. That’s the cutest dog I’ve ever seen. He appears very obedient.